﻿ DE BRAGA by ARTOTEL, Bandung | FROM $32 - SAVE ON AGODA! "Very comfortable hotel which located in bandung city center..."
"Nice new hotel along Braga, so everything looks new and great"
"A nice hotel with friendly staff"
"Lobby area very good environment." 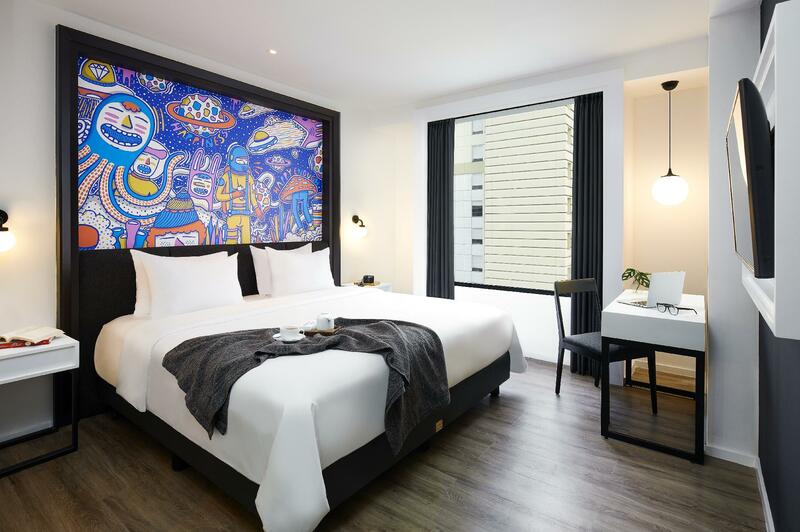 Whether you're a tourist or traveling on business, DE BRAGA by ARTOTEL is a great choice for accommodation when visiting Bandung. From here, guests can make the most of all that the lively city has to offer. With its convenient location, the property offers easy access to the city's must-see destinations. 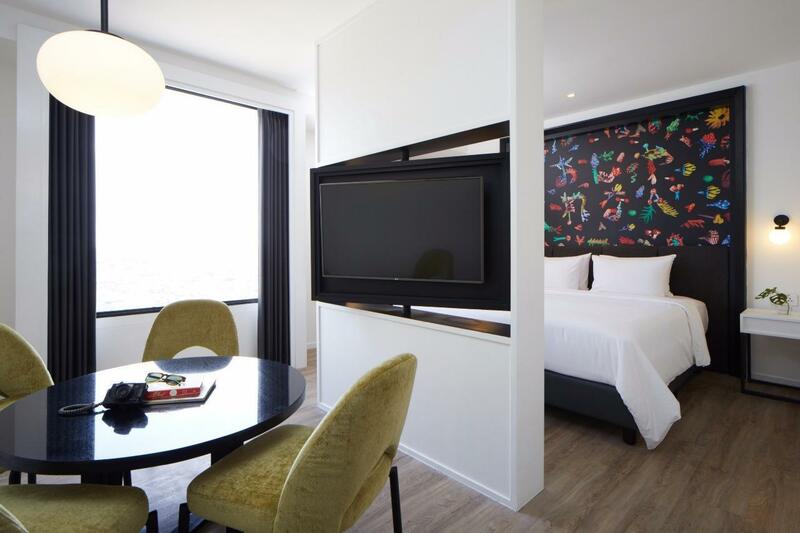 At DE BRAGA by ARTOTEL, the excellent service and superior facilities make for an unforgettable stay. The property provides free Wi-Fi in all rooms, 24-hour room service, 24-hour security, daily housekeeping, gift/souvenir shop to ensure the greatest comfort. All guestrooms feature a variety of comforts. Many even provide complimentary tea, closet, towels, clothes rack, slippers to please the most discerning guest. The property's recreational facilities, which include outdoor pool, pool (kids) are designed for escape and relaxation. 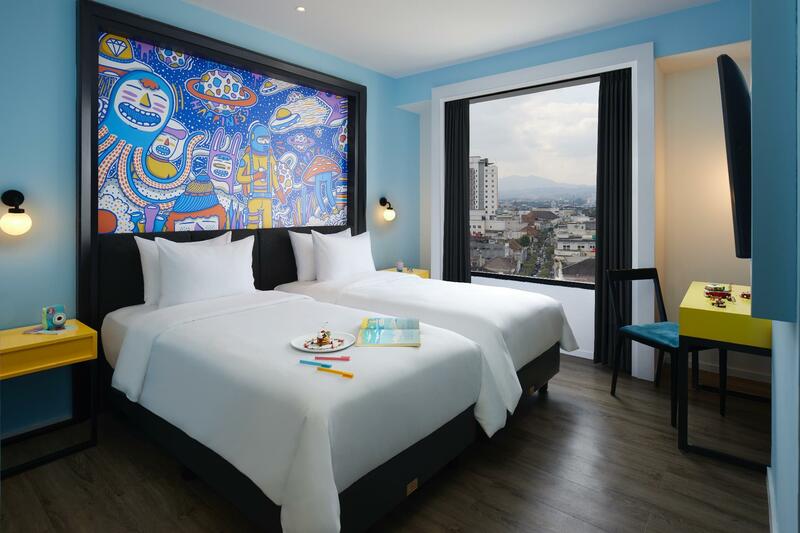 Whatever your reason for visiting Bandung, DE BRAGA by ARTOTEL is the perfect venue for an exhilarating and exciting break away. "Great location, comfy room, good interior and proximity for..."
The interior of the hotel is awesome, very artsy. Staff excellent (even though we need to ask for our welcome drinks by ourselves). Didn’t try breakfast since the reviews are bad. Booked 3 rooms, got 2 connecting ones, the let down is the bed. They don’t have king-size bed, instead they put 2 beds together, even there are 2 blankets, half half, not comfortable at all, definitely cannot sleep in the middle area. Towel is thin & no hand-soap (until I asked for one). Parking lot is small so they give free valet service, sometimes very inconvenient (we waited almost 30 mins for our car). The hotel location is strategic, near Braga street. easy to find restaurant, such as Rasa Resto, Braga Permai resto, and also cafe such us starbucks, braga art cafe, or warung kopi purnama. The hotel is a little bit noisy, i can hear music from 3rd floor (swimmingpool area) where our room is on 12th floor. If your destination in Bandung around Braga and Alun-Alun, It worthed to stay in De Braga, you walk to around the Hotel. The hotel is still new, so the interior & furniture still look good & clean. Limited parking lot, but they have valet parking. Room was great, bathroom shower is a bit noisy. Breakfast selection could be improved i guess. Unfortunately there’s no gym available. Nice meatspace and it’s in a very strategic location, so overall it was a great stay. It is a clean hotel. Overall, the young staff are friendly. But the location is very crowded, traffic is crowded. I went to breakfast but it is crowded because there are many people. So I did not eat. And I did not have room service menu in the room, so I asked by phone. Overall it is a clean hotel. De Braga postion on very strategic location, you can explore natural Bandung building and food from this street. Front staff very helpful (name is Agung), he is so professional and nice with all quest. Need to improve on restaurant area, when breakfast he ask room number to validate over and over, make us and other quest uncomfortable. Hotel facilities overall good, design interior is cozy. Stayed 1 night in Deluxe room. - kinda hard to see the hotel sign. Might miss it if I didn't look for it carefully - no sign of front office, only big table with PC(s). + quick check in and check out. Staffs didn't need my agoda booking ID, they just found my booking using my name. Great job! + it's quite new building with artsy design + located just behind Asia Africa road + clean bathroom, clean sheet, and room + One of the staffs recommended legendary local Mie Kocok, we tried it, and we loved it! فندق رائع من حيث المال والموقع والهدوء وطاقم العمل الذكور والاناث، ديكوراته رائعه والأسرة كذلك، بإستثناء الحمام لا يوجد فيه شطاف، طاقم نشيط يحب المساعده A great hotel in terms of money, location, tranquility, male and female staff, wonderful decorations and family as well, except for the bathroom where there is no Shattaf, an energetic staff who loves help. Stayed 4D3N in De Braga for our pre-honeymoon. Good hospitality, great location and staff were super friendly (greet us everytime we bump into each other at the lobby)! Everything is a few mins away from hotel. Had dinner on our last day,and it was nice and the price is very affordable. Would definitely stay here again whenever we go to Bandung. Keep it up! Good room layout, good coffee in the room, good breakfast, friendly & humble staff, many television channel, and good location. Please add more electricity outlet near table and strengthen internet connection. But overall is good and i will recommend this hotel to all my colleague. 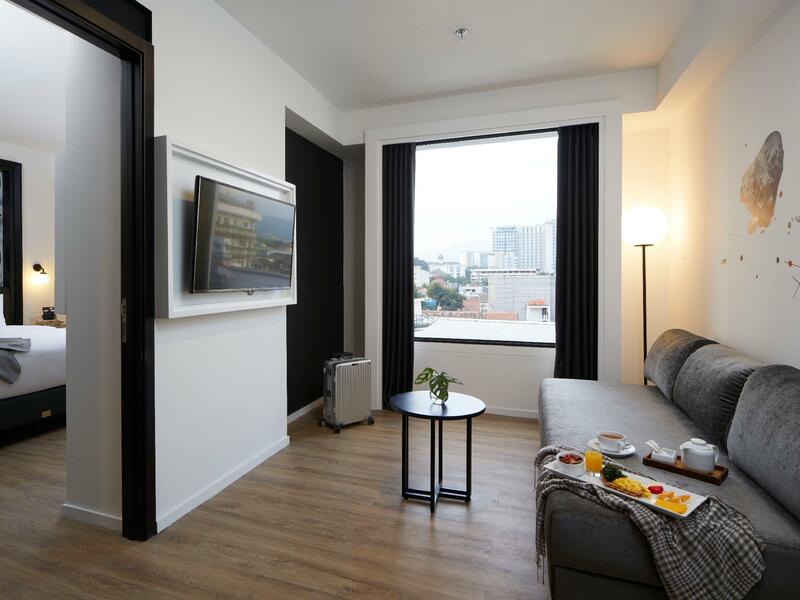 The hotel is new located in the heart of Bandung city. De Braga has a nice design, and very warm staff. Breakfast was very good, but the staff should get trained again to be more professional and deliver quality service. Hopefully the managers will maintain well; this nice hotel! To call it a budget hotel is an understatement. It’s a couple months old hotel right smack in the middle of the town. The lobby was refreshing. Stayed in suite 25 room which has a decent space and nice comfy king sized bed. AC worked well so did the hot power shower. Room WiFi was speedy and easily connected. A big led tv with multiple channels except that no live telecast for epl?? Breakfast spread was good and tasty however too slow to replenish when empty. Swimming pool is of adequate size but hardly see anyone swim perhaps too tired after a daylong shopping/sightseeing activity. Everyone was eager to help you and they smiled alot, nice! Clean hotel, dolce gusto in the room, location is great for night sightseeing. Perfect location, between Jl. Braga & Jl. Asia Afrika where you can find many touristy things and recommended place to eat. We stayed in studio room 25, quite spacious with wide and comfy bed. The bathroom arrangement was good too. Breakfast was good, many varieties and delicious too. Nice and helpful staffs also made us love this hotel. This is my second experience to stay at Artotel chain within Indonesia. First location was Yogyakarta. So far Artotel never disappoint me with its interior design & friendly service. I'd have to say that it was good to stay in de Braga Hotel. I stayed for a couple of night for seminar and workshop. And I liked when I came to the Hotel and wanted to check in. The staff gave me a glass of syrup. I must say that the service was good. The location was really nice. Although, I didn't have much time, but I could sightseeing tour while I went to seminar venue . de Braga Hotel is located in Braga Street, so there were interesting place that I could see there. One thing I didn't like from this hotel was the food for breakfast. If I can give a score for the breakfast. Maybe I'll give 6.5/10. But, I thougt that wasn't a big deal. After all, this hotel was good. And I'll recommend this hotel to my family and friends.